The Parish has three spaces available for public hire, all with toilets and catering facilities. The Parish Centre was built in the 1970s as a meeting place for St Michael’s church and the wider community. It consists of two rooms and is regularly used for meetings, children’s music groups, and parties. The fully-equipped downstairs kitchen includes a rope-driven service lift, giving easy transfer of food, plates, etc., between the two storeys. The interior of the Memorial Hall. The Memorial Hall is located on Branch Road, St Albans. It was built in 1925 to commemorate lives lost in World War I. 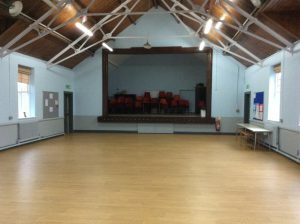 With a raised stage and a capacity for 100 people, the hall is ideal for local activity groups, productions and children’s parties. This popular hall is hired by the community 7 days a week and is also the local Polling Station. 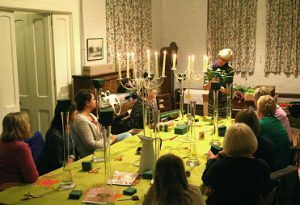 A flower arranging class in the School Room, Childwick. 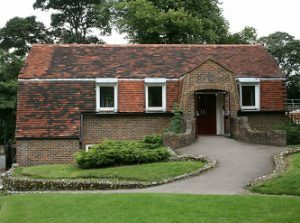 The Victorian Schoolroom to the rear of St Mary’s was originally used to educate workers and their children on the Childwickbury estate. It is a charming space, seating up to 25. The amenities consist of a galley kitchen with fridge and tea making facilities. There is an outside toilet. Currently the Schoolroom is in regular use by small groups and clubs wishing to pursue their hobbies of water colours, flower arranging, stamp collecting, etc. It is a good venue for parish quiet days. If you would like further information including Terms of Hire and cost, please contact Danielle Argent on 01727 836041, or email by clicking here. The office hours are Tuesday to Thursday 09.00 to 12.00. Outside these hours, please leave a message or send an email and Danielle will respond when she is next in the office.